A true son of the north of England, who yet holds a premier place among so many famous horses bred in Yorkshire, The Flying Dutchman won his every race, but one, got classic winners in Great Britain and France, and had an everlasting influence on the breed through an English daughter and a French son. His sire, Bay Middleton (1833), bred and raced by Lord Jersey, was unbeaten in his two seasons on the turf, before a "suspicious" foreleg forced his retirement after his last race, a match at Newmarket against Muezzin, which he won easily. His other wins included the Riddlesworth Stakes, a walk-over in Newmarket's Bruton Street Stakes, the Two Thousand Guineas Stakes, the Buckhurst Stakes at Ascot, the Grand Duke Michael Stakes, and the Epsom Derby in which he beat Gladiator, Venison and Slane "...perhaps the most distinguished cluster of future stud cracks." He was the son of Derby winner Sultan, and out of Oaks winner Cobweb. He had a great, free stride, a brilliant turn of speed, and a high-spirited temperament, unruly in training before his first race. Bay Middleton was purchased as a stallion for the huge sum of £4,000 by Lord George Bentinck. 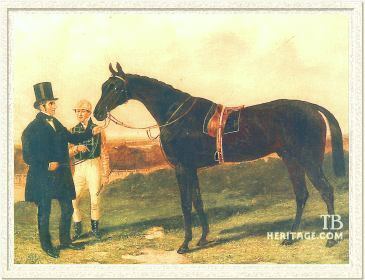 He led the sire's lists in 1844 and 1849: in addition to The Flying Dutchman he got One Thousand Guineas winner Aphrodite, Derby winner Andover, Two Thousand Guineas winner The Hermit, the good sire Fly By Night, and some excellent broodmares, including Yorkshire Oaks winner Ellen Middleton, the dam of Wild Dayrell, and also the dams of Saunterer, Mainstone, St. Leger winner Sunbeam, and Mainbrace (dam of Fisherman). The Flying Dutchman was the fourth foal of the Sandbeck daughter Barbelle (1836), a good producer for her owner, Henry Vansittart. Vansittart was the grandson of Henry Vansittart, a director of the East India Company and Governor of Bengal (1760-1764, India), one of the nabobs who had amassed a fortune in the trade. Henry inherited his grandfather's estate, Foxley Court near Bray, Berkshire, from his father, (also) Henry, who died fairly early at age 31. 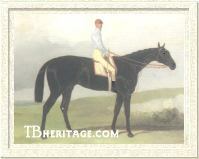 Vansittart was a long-time owner and breeder of thoroughbreds, having joined the Jockey Club in 1810. One of his first successes on the turf was Burleigh (1805, by Stamford), and his brother, Treasurer. Burleigh won seventeen races at Newmarket between 1808 and 1811, including the Jockey Club Plate. Treasurer dead-heated with Whalebone in the Newmarket Stakes of 1810, losing the run-off. They were out of a mare by Mercury, who also produced their full sister, Belvoirina, winner of three races and a successful broodmare in the Hampton Court Stud. In 1812, age 28, Henry Vansittart married Theresa Glendowe-Newcomen, the widow of Sir Charles Turner (owner of Hambletonian and Beningbrough), thereby gaining Kirkleatham, Turner's Yorkshire estate. In 1820, Vansittart, who had a J.D., served as Yorkshire's High Sheriff. After Vansittart's death in 1848, Theresa continued to breed on a small scale; her sole heir, daughter Teresa Vansittart eventually inherited Kirkleatham. The Vansittarts owned several generations of Barbelle's tail-female antecedants, beginning with her great-grandam, a mare by Pot-8-Os (1796), who produced Arquebusade (1808), Selima (1810), Slim (1815) and Slight (1816, who bred on, tail-female ancestress of Derby winners Fifinella and Pinza and many more winners), the three latter animals by Selim. Selima, to the cover of Amadis, produced Darioletta (1822), who ran at Newmarket; Financier (1816, by Treasurer), a winner at Newmarket and second in the Claret Stakes; and Flibbertigibbet (1817, by Comus) who was a winner, and later a sire in Theobald's Stockwell Stud. Darioletta was a good producer, dam of the Whisker colt Perion (second in the Epsom Derby) and the Catton colt Florestan, both winners, of Manchester Cup winner Galaor, and of Barbelle (1836), by Sandbeck (1818, by Catton, out of Orville's sister, Orvellina (by Beningbrough). Sandbeck had raced for Lord Fitzwilliam, winning the Club Stakes at Doncaster in 1823 and York's Fitzwilliam Stakes in 1824. Sandbeck's most notable racing son was Redshank, twice winner of Newmarket's Craven Stakes, of Gold Cups at Lincoln, Stamford and Nottingham, of Queen's Plates at Leicester, Northampton and Nottingham, and of several additional stakes races, and later a modest sire of some stakes winners. Barbelle was short-legged and lengthy, around 15 hands tall, and had a "springy wire-hung action." When Barbelle dropped The Flying Dutchman on February 27, 1846, her 1844 ill-tempered (he required a muzzle while in training to prevent biting) brown colt Van Tromp, by Lanercost, was about to embark on his successful juvenile season in the ownership of the Earl of Eglinton, who at the time was racing, mostly unsuccessfully, Barbelle's second foal, De Witt (later called Make-ready, by The Provost). Van Tromp was a different proposition from De Witt, showing in his first season on the turf that he was one of the best, if not the best, of his generation, winning Liverpool's Mersey Stakes, Goodwood's Lavant Stakes, and Doncaster's Champagne Stakes. 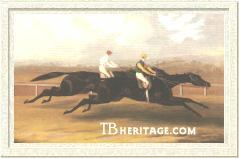 He went on at age three to prove himself a good stayer with a nice turn of speed, winning Epsom's Gateshead Stakes, Newcastle's North Derby, the Liverpool and the Doncaster St. Legers, the Goodwood Cup, the Emperor of Russia's Plate at Ascot (Ascot Gold Cup), and a 300 sovereign match against Cossack at Goodwood. He ran second in the Epsom Derby, a race in which his owner, Eglington, and several of his fellow-owners (Lord George Bentinck and Charles Greville) who had heavily backed Van Tromp, felt he had been pulled by his jockey, Job Marson. Marson indignantly refuted the accusation, and was supported by his fellow jockey, Charles Marlow, but Marson was dismissed from riding Eglinton's horses (he would later win the classic races on Voltigeur and Nutwith). Marlow went on to ride Van Tromp and The Flying Dutchman for Eglinton. Barbelle's second foal, Van Tromp Eglinton sold Van Tromp to York horse dealer Thomas Kirby, and he stood at stud in Yorkshire until 1852, when he was sold to Czar Nicholas and sent off to Russia, "where he became a great favorite." In England he left some winners, including Van Galen and Ivan. Van Galen was sire of the great stayer Tim Whiffler, winner of the Chester Cup, Goodwood Cup, Doncaster Cup, Ascot's Queen's Vase and several other high-class stakes and later an influential sire in Australia. Ivan was a good winner and got Union Jack, the best of his year. Van Tromp's son Vandermulen won the Lincoln Handicap, and Van Tromp got a number of other winners before shipping off to Russia, where he also sired runners. After the success of Van Tromp in the Doncaster St. Leger, his satisfied owner, Lord Eglinton, arranged to purchase all of Barbelle's successive "good" foals at £1,000 each, beginning with the yearling colt The Flying Dutchman. After The Flying Dutchman, Barbelle produced seven more foals, five of them by distinguished racehorses -- Bay Middleton, Orlando, Pompey and West Australian -- and three by the relatively useless stallions Pottinger, Ashgill and Wingenund. The Druid records she was "...sold, some years after the Dutchman's birth, for 40 sovereigns, at auction and sent to Ashgill with a filly foal by Pottinger, at her foot. The two were soon separated, and, for a while, indulged in a succession of responsive bewailings. The mare, old and ragged, was placed in a cart stable; and, with her light neck and drooping quarters looked more like a worn-out hack than a blood brood mare that had produced three yearlings which fetched 1000 gs. a-piece, one of them credited with a Derby and St. Leger and Ascot Cup and another with a St. Leger, and the Ascot and Goodwood Cups." Of Barbelle's other foals, the best was W. Stirling Crawfurd's Zuyder Zee, by three-time leading sire Orlando, the beautiful Derby-winning son of Touchstone. Zuyder Zee, like his sire a notably handsome animal, was also a first-class runner and a great weight-carrier, winning Goodwood's Chesterfield Cup carrying top weight; Doncaster's Ftizwilliam Stakes; Epsom's Craven Stakes, beating Saunterer; Newmarket's Houghton Handicap, and several other good races up to the age of six, after which he retired sound to stud. His daughter Bounceaway produced Goodwood Cup winner New Holland (1872) to the cover of Young Melbourne. Barbelle's other offspring included The Dutchman's brothers Vanderdecken (1850), a poor runner and unsuccessful sire and De Ruyter (1848), also undistinguished on the turf who got some modest winners at stud in Ireland; and Kirkleatham, later re-named Van Dieman, by West Australian, another horse that did not make a mark. Her daughter Amine (1855), by Pompey, was second dam of Gimcrack Stakes winner Cheroot; her first foal, an unnamed filly by Muley Moloch bred on for a few generations, and her Ashgill filly The Folly (1859) also bred on. The Flying Dutchman developed into a long-backed, well-balanced colt with good bone and a great sloping shoulder and a powerful hind end which contributed to his long-striding action and speed that so impressed observers and made it so tough for horses to run beside him. Standing at 15.3, he had a slightly roman nose and large-ish ears, with "an eye replete with intelligence, yet full of fire, betokening what he possessed - unflinching courage." He was slightly over at the knees, a fault he passed on to many of his descendants. The phrase "the best horse that ever looked through a bridle" was frequently used in describing him as a racehorse. His owner, Archibald William Montgomerie, was the 13th Earl of Eglinton (1812-1861), referred to as the "most popular man in the three kingdoms," having served as Lord-Lieutenant in Ireland, where he had a reputation as a generous, open-handed, and fair-minded administrator. A member of the Jockey Club, he raced his horses in England and Scotland, and had won the St. Leger with his good filly Blue Bonnet (1839, by Touchstone) in 1842. Up until 1844 his horses were trained by Scottish trainer George Dawson, who had schooled four Ayr Cup winners for Eglington, and his son, Tom Dawson, who had trained Blue Bonnet, at Brecongill stable at Middleham, Yorkshire. After that, Eglinton had his horses schooled by a private trainer, John Fobert, at Spigot Lodge, Middleham. The Dutchman was sent to Fobert, and, according to The Druid, "Marlow was perfectly delighted when he first mounted The Dutchman, and followed Van Tromp up the gallop; and on returning with him, remarked to the Trainer, Fobert, that he 'had never been on such an one before.' His stride was enormous; and, at the end of his two year old season, the Turf savants declared that the magnificent son of Bay Middleton had never been extended." The Dutchman was undefeated at age two. He started his season at Newmarket, winning the July Stakes with seven other two year olds in the field, and followed that at the same meet by winning a 400 sovereign sweep stakes beating two others in a canter. He was taken to Liverpool, winning a £1400 sweep there, beating three other youngsters. The next stop was Doncaster, where he won the important northern juvenile test, the Champagne Stakes, easily, followed by his final triumph of the season, the Two Year Old Stakes, beating four good colts, including Raby, who would win the Cambridgeshire the following year. His first race at age three was the Epsom Derby, held on bad going due to three days of rain. After three false starts, the field of twenty-six--including many high class future winners--got away, and after a mile The Dutchman was in the lead by a length, although struggling in the mud, when he was challenged and passed by the Sir Hercules colt, Hotspur, who came up, seemingly out of nowhere, clearly not bothered by the heavy going. With close to a length to make up near the finish, Marlow struck The Dutchman twice with his whip--the only time the horse ever felt it in his entire career--and he responded by opening up his huge stride, beating Hotspur by a short neck. According to The Druid, Hotspur's jockey, George Whitehouse, "...always maintained that he had won, and the only response Marlow ever made to this bold assertion was, 'You won at the wrong place, George; you didn't win at Judge Clarke." The Dutchman's next races were walk-overs for a Produce Stakes and for the Bickerstaffe Stakes at Liverpool. Back at Doncaster in the fall, he easily won the St. Leger by two lengths, beating Two Thousand Guineas winner Nunnykirk and eight other horses. A few days later he took a walk-over for the Foal Stakes at Doncaster. He went to Newmarket in October for a scheduled match against Honeycomb (by Bay Middleton), who had run fourth in his St. Leger, and Honeycomb's owner, Lord Clifden, paid a £500 forfeit, rather than run the race. At Newmarket Houghton he won the Belvoir Stakes by eight lengths, and was retired for the season. In 1850 he was brought out for the Emperor of Russia's Plate (held in place of the Ascot Gold Cup), trouncing a field of four others -- including the aging Canezou, winner of the Goodwood and Doncaster Cups in 1848 and the Goodwood Cup in 1850 -- by eight lengths. His next race was a sweep at Goodwood for four year olds over 3 miles-5 furlongs, which he won by ten lengths. Then, disaster. He met the year-younger Voltigeur for the first time in the Doncaster Cup (the only two to run), Voltigeur having won, like The Dutchman, both the Derby and St. Leger, the latter only two days earlier after a dead heat. It was expected that The Dutchman would easily beat the younger horse who had been tried so hard so recently. But it was Voltigeur who passed the finish line first, half a length ahead of The Dutchman. In 1882 The Daily Telegraph, in reviewing the life of jockey Charles Marlow, who had died in poverty at a workhouse: "To this hour, the spectacle presented by Lord Eglinton as, pale with emotion, he leant against the wall of the Jockey Club Stand, has not faded from the memory of those who sympathetically looked on." Many excuses were offered for The Dutchman, any of which might have had a bearing on the race. First, he was giving Voltigeur 19 pounds; but, that was in keeping with the age and experience of each horse. Second, the day before the race Fobert had, "with more ostentation than sagacity" galloped The Dutchman hard over the Doncaster course, although in Fobert's defence it should be noted the horse was short of work coming to Doncaster, anticipating a forfeit by Voltigeur and when word came Voltigeur would run, he tried to get The Dutchman in some kind of shape to run. Third, for the first time, The Dutchman had refused to eat prior to a race, and was "unusually irritable" when taken out for exercise. And finally, it was said Marlow was drunk, or at least midly intoxicated, when he mounted the horse for the race, and, ignoring Fobert's instructions to wait until six furlongs from home to let The Dutchman go, purportedly exclaimed "I'll show them what I have got under me to-day," and started the horse at a tremendous pace "...There are many still living, who have been familiar with horseraces for fifty years, and who have not yet forgotten the pace at which The Dutchman made the running as he passed the stand for the first time. Round the turn they flew, and up the hill, The Dutchman still leading, until the Red House was near....Voltigeur followed a couple of lengths behind his leader, until a little below the distance, when the three year old closed with his hitherto invincible rival. Then, to his amazement, The Dutchman's jockey, sobered by the intensity of his excitement, discovered there was no steel left in the wonderful animal beneath him." Later, however, one of the race's Judges said he heard Lord Eglinton tell Marlow "now, go and make an example of him," inferring Marlow was, rightly or wrongly, interpreting Eglinton's instructions to force the pace. Before the Doncaster Cup Eglinton had agreed to either sell or lease (accounts differ) The Flying Dutchman to the newly-formed Rawcliffe Stud Company, one of the first studs founded strictly as a business proposition, headed by Henry Stafford Thompson. According to a cousin of Thompson's, The Dutchman was to be retired after the Doncaster Cup, and when he lost that race, Thompson prevailed upon the Earl to keep the horse in training for a match against Voltigeur to salvage the horse's reputation, upon which the fledgling stud company was largely basing its inaugural years. Ultimately, Rawcliffe Stud Company foundered, but Thompson went on to found Moorland Stud, near York, which had greater success: Lord Clifden, Thormanby and Speculum were all sires at the latter stud. The Great Match In any event, The Dutchman's Doncaster Cup defeat led to one of the greatest matches in thoroughbred history, one that absorbed the entire Yorkshire population and the racing world at large. On May 13, 1851, for a purse of 1,000 sovereigns, The Dutchman and Voltigeur met again for a two mile run over York's Old Course. Handicapped by that "father of the turf" Admiral Rous, The Dutchman received an 8- 1/2 pound penalty, one of the few times a fraction had been applied in weights. Huge crowds thronged to the meet, the attendance at Knavesmire the largest ever known to that date, with people walking several days to York to witness the event. The Dutchman beat Voltigeur by a length, and then was retired to stud, having reburnished his deserved reputation as a great racehorse. The Flying Dutchman was sent to Rawcliffe Paddocks, located on part of the old Knavesmire race course in Yorkshire, initially standing at a fee of 30 guineas. Other Rawcliffe inaugural stallions included Slane, at 7 guineas, and Doncaster Cup winner Chanticleer at 20 guineas. St. Leger winner Newminster was added the year before The Dutchman went to France, and the stayer Leamington, later to gain fame as a stallion in the U.S.A., arrived the year after. The Dutchman's good running daughter Brown Duchess was a yearling whose triumphs were still in the future when he was sold in 1859 to Napoleon III's National Stud in France for 150,000 francs and shipped off to the Paris depot, where he stood from 1859 until his death in 1870. The general consensus of contemporary turf observers was that he was a failure as a stallion in England, but he was a creditable sire whose progeny kept him in the top ten of the sire's lists between 1855 and 1862, including three successive years in second place. The Dutchman, despite his heavy use at Rawcliffe --purportedly bred to fifty mares in his first season there, a huge number for the time -- got very few winners from the number of mares bred, which undoubtedly led to his reputation as a "comparative" failure. He first showed up on the sire's list in 1855, when his first crop were juveniles, and was listed at number six, well behind the leading sires Touchstone, Orlando, Birdcatcher, and Melbourne. The Dutchman achieved fourth place on the leading sire's list in 1856, well behind Birdcatcher, with Orlando second and Melbourne third; he had eighteen winners, including his sole Derby winner, Ellington. In 1857 he dropped to fifth again, and in 1858 to seventh. In 1859 he jumped to second, with progeny winnings of £11,403, behind Newminster with progeny earnings of £17,388, and he sustained second position in 1860 and 1861 (behind the powerhouse that was Stockwell, whose first crop debuted in 1860), due largely to Flying Duchess' triumphs, although by then he was in France. He sired some good winners in England, and some very influential broodmare daughters. His old nemesis Voltigeur, by contrast, made the top ten on the lists six times during his long life in England, and was never higher than fourth, although his finest and most influential offspring, Vedette was to have a significant influence on bloodstock breeding by getting Galopin, who was out of The Dutchman's daughter, FLYING DUCHESS. The Dutchman also became known as a sire of excellent hacks and courageous, tough jumpers. It was in France that he achieved his most lasting success as a stallion. He got DOLLAR, a good race horse and extremely influential in the stud in France, where through him the Byerley Turk sire line flourished, with Sea Sick, Omnium II, Bruleur and his son Ksar and grandson Tourbillon, both French Derby winners, and many other French classic winners and top sires issuing from him in direct sire line descent. The Dutchman got a number of other good winners in France, several of which were shipped across the channel to beat the English horses in important handicaps. The Dutchman also had a big influence on breeding in New Zealand and Australia, through his grandaughter Mermaid (1860), out of daughter WATERWITCH, who established an important colonial female family; Mermaid's great running daughter Lurline became the dam of Darebin, a great runner and sire in Australia and later, in the U.S., sire of Commando's dam, Emma C. Another daughter of The Dutchman's, ROSE DE FLORENCE, was the dam of one of the greatest colonial-bred sires, Maribyrnong (1863, by Fisherman), and another good colonial runner and sire, King of the Ring (1869). The Dutchman's son PETER WILKINS (1853) also became an influential sire in Australia, dam's sire of Malua, winner of the three mile Grand National Hurdle and of the Melbourne Cup on the flat. ELLINGTON (1853) was The Dutchman's only Epsom Derby winner. He was out of the great broodmare Ellerdale, by Cambridgeshire and Ascot Gold Cup winner Lanercost (sire of St. Leger winner Van Tromp), grandson of that great stayer and progenitor Tramp. Ellerdale had been a good filly on the turf, winning the inaugural running of Doncaster's Gimcrack Stakes, and also Doncaster's Park Hill Stakes, and York's Great Yorkshire Stakes. In the stud she not only produced her Derby-winning son Ellington, but Oaks winner Summerside (probably West Australian's best offspring) and Chesterfield Handicap and York County Plate winner Ellermire (by Chanticleer) who was later dam of Ascot Gold Vase winner Elland and The Ill-Used. Also to the cover of The Dutchman she produced GILDERMIRE (1855), who dead-heated with Governess for the 1858 Oaks, losing in the run-off, and who won that year the North of England Biennial at York. Ellerdale had been bred and raced by Captain (later Admiral) O.V. Harcourt of Swinton Castle, Masham, and he also bred her offspring. Ellington Ellington was a dark brown colt; he debuted as a juvenile in York's Eglinton Stakes, running fourth to Mosquito. A few days later he won the Sapling Stakes, and, sent on to Doncaster, he won the Champagne Stakes beating a good field that included Artillery, Vandermulen, and Bird-in-hand. Over the winter Harcourt's coachman rode him "and made [him} as handy at gate opening as a hack--the first time probably that a future Blue Ribbon winner has so passed the previous winter." At age three he ran second to Fisherman in the York Spring Biennial, and was second to Bird-in-hand in Chester's Dee Stakes. His next race was the Derby, which he won by a length over a good field of youngsters that would later distinguish themselves as runners or sires, including the perennial second-placed high class runner Yellow Jack, Two Thousand Guineas winner Fazzoletto, Leamington, Bird-in-hand, Artillery, future Manchester and Liverpool Cup winner Pretty Boy, future Goodwood Cup winner Rogerthorpe, in all a field of 23. He did not run again until the St. Leger, in which he was unplaced, and at the same Doncaster meeting ran second to Artillery in the Don Stakes and fourth to Bonnie Scotland, Manganese and Aleppo in the Doncaster Stakes. After one more unsuccessful try, at Kelso, he was retired, sound and clean-legged, to stud at Willesden Paddocks at Kilburn for a fee of 15 guineas. In 1862 he was shown at the Royal Agricultural Show at Battersea, winning the first prize. He was not a success as a sire, although his daughter Picciola (1870) produced Filiberto and Carl Andrea, both winners of the Gran Premio del Re Imperatore, later known as the Italian Derby, and her daughter Proserpina produced a top Italian runner in Hira. Ellington's sister, GILDERMIRE (1855), won Doncaster's Champagne Stakes and was second to Saunterer in the Eglinton Stakes as a juvenile. She went on at age three to dead-heat with Governess for the Oaks, losing in the run-off. She also won the Biennial at York at age three, and was second to Saunterer in Doncaster's Eglinton Stakes. Part of the draft of Harcourt's horses sold to Lord Londesborough in 1858, she was later shipped off to Australia as a broodmare. Brown Duchess BROWN DUCHESS (1858), the only other classic winner by The Flying Dutchman, was out of the Liverpool daughter Espoir (1841), and so closely related to Ellington, whose dam's sire, Lanercost, was by Liverpool. Espoir was one of the first group of mares purchased by Rawcliffe Stud Company to support their stallions, and it seems likely the similarity of her breeding to Ellington's dam was a factor in her purchase from Sir Charles Rushout, in the hopes of producing another Ellington. She was bred three years in succession to The Dutchman, producing EGBERT, BROWN DUCHESS, AND HOPEFUL DUCHESS. Later she produced a good runner in Park Hill Stakes winner Battaglia. Of the three Dutchman foals, only Brown Duchess was successful, and her tenure on the turf was better than that of Ellington's. Brown Duchess was a very good, and hard-used, juvenile runner who ran for a Mr. Saxon. She won her maiden debut, Epsom's Two Year Old Stakes, beating another Dutchman youngster, WALLOON, by a length, and one other colt. She followed that by a second to Queen of the Vale in Ascot's Queen's Plate in a big field of seventeen, and at the same meet won the New Stakes beating twelve other colts and fillies. She was taken to Newton, where she won the St. Helen's Purse, beating Doefoot, who would go on to win the Liverpool Cup at age three. In the Stamford Plate at Newmarket she was beaten by half a length by the four year old colt Satellite, one of American Richard Ten Broeck's imports from the U.S., in a field of eleven. At Liverpool she ran second in the Two Year Old Plate, and then won the Stanley Stakes beating two other fillies. She was taken to Goodwood, where she failed to place in the tough Findon Stakes, and then went to Doncaster, winning the Filly Stakes, in which another Dutchman daughter, VERGISS-MEIN-NICHT ran second, beating two others. Her heavy schedule this year finally extracted a toll, and she ran fourth in a sweep at Doncaster, won by Lady Clifden, and failed to place in her three final races of the season. Her first race at age three was the One Thousand Guineas, in which she ran third to Nemesis, beaten out of second place by a short head by Fairwater. Her next race was the Epsom Oaks, which she won by a neck from Lady Ripon, beating a good field that included the great runner Caller-Ou and the Guineas winner Nemesis; VERGISS-MEIN-NICHT was also in field, but never in the running. Brown Duchess went on to win a race at Ascot, beating WALLOON by ten lengths. At Liverpool she walked-over for a small purse and then won the Stanley Stakes, beating the colt Hesper and three others. She went to Yorkshire to win the Yorkshire Oaks easily, beating a field of seven other fillies, and then at Doncaster won the Park Hill Stakes by two lengths, beating two other fillies. Her next race, the Doncaster Cup, was probably her finest, demonstrating that great Dutchman heart, in which she raced home neck and neck with Derby winner Kettledrum (who was conceding ten pounds), the two passing the post together in a dead heat. Kettledrum took the walk-over and the purse was split between the two. In October she went to Newmarket, where she won the Grand Duke Michael Stakes in a canter by six lengths, again beating WALLOON, who ran a bad third. She went on to Bedford, winning the Queen's Plate there, her last race of the season. She was brought out twice in 1862, and again in 1863, but failed to place, and was finally retired to stud. Brown Duchess was the dam of Visionary (1864) by Loup-garou (by Lanercost), from whom descended the great French race mare La Camargo, the excellent French crack Massine (1920), and other good winners; Noblesse (1868), who bred on, and Berggeist (1874), winner of the Ratibor-Rennen. HOPEFUL DUCHESS also bred on, and was the second dam of New Zealand Derby winner Maxim. Of The Dutchman's other English foals, CAPE FLYAWAY was considered a good one. Out of the great race mare Canezou (also dam of Two Thousand Guineas winner Fazzoletto, St. James Palace Stakes winner Paletot, and second dam of Boiard), by Melbourne, he was a steady runner, his best race probably the Great Handicap at Newton in 1861, where he beat the St. Leger winner Caller Ou. Purchased as a stallion by the Earl of Feversham, he was used as a country sire, "...filling the country with high-class hunters, particularly from Cleveland Bay mares." IGNORAMUS (1854), out of Ignorance, by The Little Known, was considered to be The Dutchman's best son on the turf in England: he won the Prince of Wales's Stakes, beating Saunterer and a field of nine; was third to Saunterer in Doncaster's Fitzwilliam Stakes, and won a number of plates. The Dutchman's son GLENBUCK (1856) was a Rawcliffe Stud product, out of the Lanercost mare, Belsay. Of her three foals by The Dutchman, he was the best, winning the City and Suburban Handicap at age three. WALLOON (1858) was a brown colt out of Nina, bred at Hampton Court; running in Lord Stamford's colors, he was a fairly good juvenile, winning Doncaster's Champagne Stakes, beating the future Derby winner Kettledrum, and the Althorp Park Stakes at Northampton, and ran second to BROWN DUCHESS in Epsom's Two Year Old Stakes and to Big Ben in Newmarket's Two Year Old Plate. At age three he won the St. James's Palace Stakes and in 1864 the Workingham Stakes, in all winning 15 races over four seasons. TOM BOWLINE (1857) was out of the great producing mare Miss Bowe (by Catton), dam of Longbow, Oaks winner Iris, Boiardo, DeClare, and other winners; for Lord Glasgow he won a big sweepstakes worth £1400 at Newmarket October in 1860, and the St. James's Palace Stakes. AMSTERDAM (1855) was out of the Idle Boy daughter Urania; he was a top miler and weight-carrier at age five. In addition to BROWN DUCHESS AND GILDERMIRE, The Dutchman's daughters on the turf included KATHERINE LOGIE (1853), out of John Scott's great producer, Phyrne, by Touchstone. Phryne's other offspring included Elthiron, later a stallion for the French national stud; Windhound, best known as the sire of Thormanby; the good runners Hobbie Noble and The Reiver, all four by Pantaloon, and the Melbourne daughters Rambling Katie and Blanche of Middlebie, the latter winner of the Ham Stakes. Katherine was a long-running, hard-knocking filly, winning two of her nine races at the age of three, five of her 24 races at age four, three handicaps of fourteen starts at age five, and, in her last season, one of her fourteen starts. She later produced the 1867 Prince of Wales's Stakes winner King o'Scots and Two Thousand Guineas winner Bothwell, and her daughters bred on (Family 3 - i). LADY LOUISA (1858), out of the Touchstone daughter Countess of Burlington (dam of Cesarewitch winner Hartington, by Voltigeur) won the Stockton Biennial for her owner, Henry Robinson. She bred on for a few generations. VERGISS-MEIN-NICHT (1858), bred by John Bowes, was out of his good mare Forget-Me-Not, whose first foal had been Derby winner Daniel O'Rourke (by Birdcatcher). Sold to Mr. Padwick, she won the Bentinck Memorial Stakes at Goodwood. Her daughter, Lady Love, by Blair Athol, won the Woodcote Stakes and produced a number of daughters that bred on (Family 9-b). Lady Love was second dam of German Derby and St. Leger winner Tuki and of French Oaks winner Ordonnanz; this family went to America with Lady Love's grandaughter, Fair Vision, and such horses as Singing Wood, Greek Song, Silent Screen, Dark Mirage, Indian Skimmer, Hill Prince, and Java Gold descended from her. Of his daughters that became good -- or at least highly significant -- broodmares, the place of honor goes to FLYING DUCHESS (1853), out of the Voltaire daughter, Merope. She produced few foals, and was nineteen years old when she dropped Galopin to the cover of the seventeen year-old Vedette, son of The Dutchman's nemesis, Voltigeur, who stood at the Diss Stud in Norfolk. Vedette had gotten few good runners until he met Flying Duchess -- Speculum, winner of the City and Suburban Handicap and the Goodwood Cup was his only really good one. Flying Duchess and Galopin were sold for 100 guineas to William Blenkiron of Middle Park Stud, and Galopin was sold at the stud's annual yearling sales to Prince Gustavus Batthyany, for whom he raced, winning five of his six starts at age two and the Derby and four other races at age three. 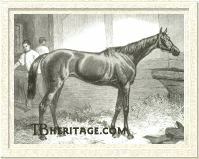 Galopin became the sire of classic winners and of the great unbeaten St. Simon, the preeminent sire of the late 19th century in England. 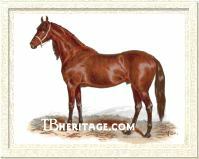 Flying Duchess also produced an older sister to Galopin, Vex, who was tail-female ancestress of Dinna Forget and McGee, the sire of the American runner Exterminator. The Dutchman had additional daughters that produced good winners or had special significance to the breed. BONNY BLINK (1857, out of the Touchstone daughter The Prairie Bird), was dam of St. Leger winner Hawthornden (1867). BRITTANIA IV (1859), was sent to America, where, to the cover of Lexington, she produced Madame Dudley (winner of the Champagne Stakes) and Brown Prince; Madame Dudley was second dam in tail-female of Saratoga Cup and Suburban Handicap winner Olambala. PENNANCE (1857), out of Rosary, a sister to Derby and St. Leger winner Surplice, by Touchstone, had three daughters that bred on successfully (Family 2 - i): the great French crack and sire Ajax (1901) and Cambridgeshire Stakes winner Double Life (1926), later dam of Precipitation and Persian Gulf, were just two of the many good winners and influential animals descending from her. THE DUTCHMAN'S DAUGHTER (1854, out of Red Rose by Rubini), was the granddam in tail female of Dead Lock, the dam of the great racehorse and sire Isinglass. A number of other English daughters of The Dutchman bred on, and are seen in the far reaches of the tail-female lines of many winners around the world. Sold to the French National Stud, reinvigorated under General Felix Fleury, Master of the Horse in the Second Empire, The Flying Dutchman was installed at the Paris Depot. He got some very good runners there, but his most influential offspring by far, was Dollar, who became a leading sire and progenitor of the Byerley Turk sire line in France. DOLLAR, born in 1860, was a member of The Dutchman's first crop in France. He was out of the Slane daughter, Payment, who had been imported from England in 1853 at age five, in foal to Surplice, and so was, in effect, an English thoroughbred bred in France, and in fact, he crossed the channel twice to win some races in England. Dollar Dollar was bred and raced by the influential owner and breeder Auguste Lupin. He won the Prix de la Société d'Encouragement over 2200 meters, the 4000 meter Prix Principal, and the Grand Prix de l'Empereur (Prix Lupin) at age three, and ran second in the Prix du Jockey Club (French Derby). At age four he won the Grand Prix de l'Imperatrice (Prix Rainbow) and other races in France, and the Brighton Cup, Great Northamptonshire Handicap, and Goodwood Cup in England. In all, he won eight races in nineteen starts, on both sides of the channel, with five second place finishes, and showed himself to be a good, if not great, stayer. Retired to Lupin's Haras Vaucresson, and moved soon after to Lupin's newly-purchased Haras de Viroflay, near Paris, he got many good runners, including the unbeaten Salvator, later sire of Doncaster St. Leger winner Ossian. He also got two important sire sons. One was Upas, a winner of the French Derby, who got Derby winner Omnium II, and Elf, a great stayer who won the Prix Gladiateur and the Ascot Gold Cup and seven other races and who later got the champion runner Sea Sick. The other was Androclès, sire of Cambyse, who got the French Derby winner Gardefeu (1898), through whom the sire line continued through Chouberski, three-time leading sire Bruleur, Ksar (leading sire once), Tourbillon (leading sire three times), and beyond. The most recent classic winners from his sire line include Epsom Derby winner Dr. Devious (1989) and French Oaks winner Latice (2001). Dollar was also an excellent broodmare sire. Another good French son of The Dutchman was DUTCH SKATER (1866), from Fulvie, a French-bred daughter of Gladiator. He was an unpromising colt until age four when he won some minor races in France for his owner Louis Delàtre, including the Prix de Chevilly in Paris, the Prix des Écuries at Chantilly, two races at Fontainebleau and Caen, and the Coupe at Deauville, beating the good horses Mortemer and Trocadéro, the first intimation that he might be more than a second-tier race horse. With the occupation of Paris by the Germans, Delàtre, like many owners, sent most of his runners to England, including Dutch Skater, who won four small races there. Delàtre had been in partnership with Pol Nanquette, in a recently established stud, Celle-Saint Cloud, leased from M. Schickler (it later became famous under the ownership of Marcel Blanc), but with the invasion, Nanquette retired, forcing a liquidation of much of the jointly-held stock there, and Dutch Skater passed into the hands of Joachim Lefèvre. Lefèvre sent Dutch Skater to Phantom House stable at Newmarket, directed by English trainer Tom Jennings, who had spent much of his youth in France and Italy, and had trained the great horses Monarque, Fille de l'Air, and Gladiateur for Count Frédéric de Lagrange. It was from Phantom House that Dutch Skater emerged as a great distance runner, winning several races in 1871 and in 1872, at age six, winner of the Warwick Cup, the Great Metropolitan Handicap, and the Doncaster Cup in England, and the 6200 meter Prix Gladiateur in France. In the 1870s he stood at William Blenkiron's Middle Park Stud at Eltham, and in England got some really good running runners. He got Insulaire (1875, out of the Beadsman daughter Green Sleeves) for Count Frédéric de Lagrange; as a juvenile he won Brighton's Corporation Stakes and Newmarket's Rutland Stakes, and placed second to Janette in the Clearwell Stakes and to Pilgrimage (later dam of the famous Canterbury Pilgrim) in the Dewhurst Plate. At age three he ran second in the Two Thousand Guineas to Pilgrimage, and then was shipped across the channel to contest the Prix du Jockey Club (French Derby), which he won in a canter. Shipped back to England, he ran second to Sefton in the Epsom Derby, and then, back in France, ran second to Thurio in the Grand Prix de Paris. Back in England he embarked on a series of races in which he ran consistently-- as runner-up: behind Clocher in the Sussex Stakes, behind Sefton in the Newmarket St. Leger, behind Silvio in the Jockey Club Cup. He won the Ascot Derby, and in 1879 the Claret Stakes and the Queen Alexandra Stakes at Ascot. A good daughter of Dutch Skater's was Lord Falmouth's Dutch Oven (1879, out of Stockwell daughter Cantiniere). She was one of the best juveniles of her year in England, winner of nine races, including the Richmond Stakes, the Rous Memorial Stakes and the Dewhurst Plate, and at age three won the Doncaster St. Leger ( by 1-1/2 lengths, beating a field of 19), the Yorkshire Oaks and the Great Foal Stakes. Another daughter, Hollandaise, won Newmarket's (spring) Two Year Old Stakes, and in the stud produced French Oaks winner Solange. Dutch Skater's son Yellow (1887, out of Miss Hannah), owned by the Comte de Juignè, won the Prix de L'Avenir, the Prix à Bade, the Grand Prix du Jubilee, the Biennial, the Prix Hocquart and the Prix de Fontainebleau; he was later the sire of the Grand Steeple-chase de Paris winner Dandolo. The Dutchman's best daughter in France was DELIANE (1862), whose dam was the great running filly Imperieuse (by Orlando), winner of the One Thousand Guineas and the St. Leger, imported into France in 1859 by Auguste Lupin. For Lupin, Deliane won the Prix de Diane (French Oaks), and was favored to win the Prix de l'Empereur, but ran third to Le Mandarin and Monitor. In the stud she produced a succession of good winners for Lupin, who raced them all. Her outstanding daughter Enguerrande (1873, by Vermout), dead-heated with Camelia in the Epsom Oaks, taking the walk-over and sharing the stakes. She also won the Poule d'Essai des Pouliches (French One Thousand Guineas) and the Prix de Villebon, and was second in the Grand Prix de Paris and the Prix du Jockey Club. Enguerrande's sister, La Jonchere, won the Prix de Diane, the Prix Daru and the Prix des Cars. Deliane's son Xaintrailles (1882, by Flageolet), won the Prendergast Stakes at Newmarket as a juvenile, and at age three won the French Two Thousand Guineas, the Grand Poule des Produits, and was shipped off to England to run in the Derby, in which he did not place. He was later installed as the principal stallion at Haras de Viroflay, occupying the stall where Dollar had lived, and had moderate success as a sire. Other French offspring of The Dutchman included: Adolf Schikler's GUILLAME LE TACITURNE (out of a Strawberry Hill mare), winner of the Prix du Cadran in 1864, and the Grand Prix Boulogne sur Mer in 1863; JARNAC (1867, out of Joliette by Surplice), winner of four races in England for the Comte de Montgomery, including the Liverpool Spring Cup, twice, and the Liverpool Summer Cup; MASSINISSA (1866, out of Calpurnia, by Ion), a juvenile winner in France and at age four winner of the Grand Prix de la Ville de Lyon, and later a useful sire; TOURMALET (1862, out of La Maladetta, by The Baron), one of France's best juveniles of 1864, a three-year-old winner of the Prix de Lutece, the Poule des Produits, beating Gontran, and the Saint-Léger de Moulins, and at age four winner of five races, including the Handicap de Paris and the Prix Jeanne d'Arc at Rouen. The Flying Dutchman lives on in racing lore for his races against Voltigeur. He lives on in race horses through his grandson, Galopin, in whom he met once again, in a way, his nemesis on the turf, Voltigeur. And his long-term influence is seen through the sire line he established in France.